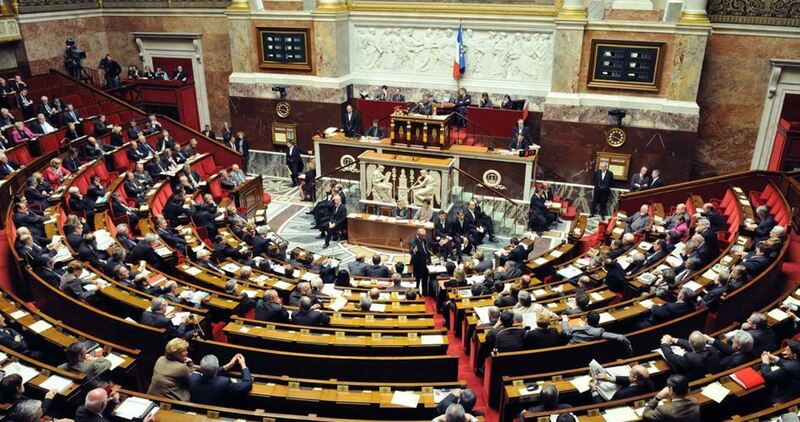 Dozens of members of the French Parliament signed a petition asking the French president François Hollande to recognize the Palestinian state before the end of his term, according to the French magazine Journal de France on Sunday. The French magazine quoted the petition as saying that France must break the deadlock of the conflict through an official reaffirmation, in the name of the non-negotiable right of self-determination, that Palestinians have the right to establish a state, which is necessary to show respect to the international law and maintain Israel's security. According to the magazine, the petition was initiated by the socialist MP Gilbert Roger, the president of the France-Palestine Group, who said, "France cannot advocate the two-state solution without recognizing the state of Palestine." The French capital, Paris, hosted in January 2017 the Paris International Peace Conference with the participation of foreign ministers and representatives from 70 countries to confer about the mechanisms of implementing the international resolutions and the possibility of holding bilateral negotiations between the Palestinian Authority and Israel. The Israeli Prime Minister Benjamin Netanyahu considered the Paris Conference an obstacle to the peace process and described it as "a French-sponsored Palestinian fraud aimed at adopting other anti-Israel stands." 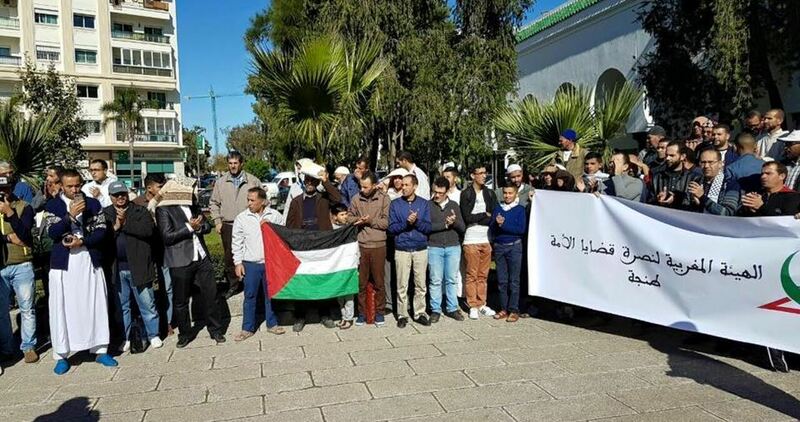 The Moroccan Commission to Support the Nation’s Causes (MCSNC) strongly condemned Morocco’s latest “normalization steps” with the Israeli occupation. MCSNC referred to the appearance of Israelis in conferences held in Rabat and Agadir as signs of deplorable normalization with Israel. MCSNC also spoke out against the incessant Israeli infringements of Palestinians’ human rights and the escalated pace of Israel’s land grab policy, along with its Judaization schemes against Palestinian holy sites, most notably the holy al-Aqsa Mosque—Muslims’ third holiest site. The commission condemned “in the strongest terms” the “normalization practices” pursued by the Moroccan government and the silence maintained by the international community as regards Israel’s illegal settlement activity across the occupied Palestinian territories. MCSNC reiterated its solidarity with the world’s oppressive groups, including the Palestinians and the persecuted Muslims of Myanmar. The Moroccan Commission urged the Muslims and Arabs to stand on guard to underway attempt to sever the chord that links the nation together. 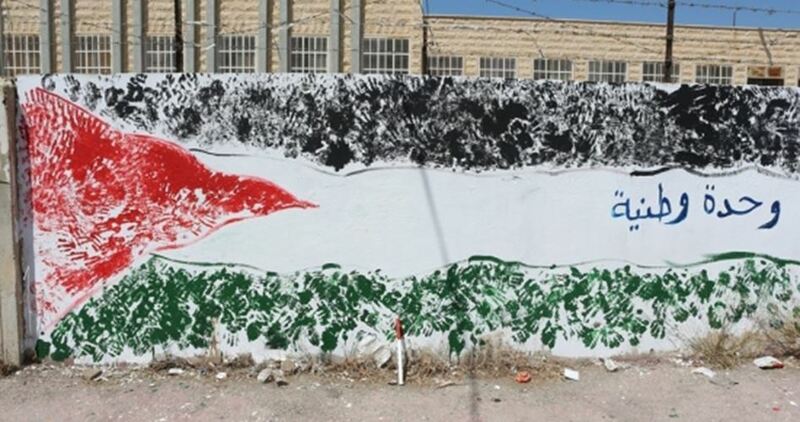 The electronic campaign which was launched by Palestinians Abroad Conference on Friday under the hashtag “Palestine brings us together” received a large scale interaction estimated at over 50,000 posts. The number of tweets at both hashtags: “Palestine brings us together” and “Palestinians abroad” exceeded 50,000 tweets. The posts' themes varied from calling for activating the role of Palestinians overseas and defending the Palestinian Question as well as the civil and political rights of the Palestinian people to sharing of Photos and videos representing the suffering of the Palestinian people in diaspora. The participants also stressed the importance to hold conferences that shed light on the suffering of Palestinians in diaspora and affirmed their adhering to the right of return. The European parliamentary delegation to Palestine has called on the EU and its member states to recognize Palestine as a state to protect and preserve it, warning that “the viability of the two-state solution is at a critical juncture” because of Israel’s large-scale settlement expansion. "The EU and the European Parliament are strongly in favor of a two-state solution as the only way to achieve peace in the Middle East. There cannot be a two-state solution without two states. The EU and its member states must recognize Palestine as a state," Neoklis Sylikiotis, head of the delegation, urged at the end of a fact-finding mission to Palestine. "After half a century of occupation it is evident that the policies we have are not working to end this conflict and finally have peace. The international community must now implement UN Security Council Resolution 2334, distinguishing between the State of Israel and the territories occupied since 1967," Sylikiotis said. The regularization bill has now made clear Israel's intent to move to the annexation of parts of Palestine, the delegation noted, stating its strong opposition to the expansion of settlements and demolitions. During its five-day visit, the delegation witnessed the scale of Israel’s settlement economic activity that contributes to the de-development of the Palestinian economy. Visiting MEPs called on European companies to comply with international human rights standards and warned against the legal, political and reputational consequences of dealing with or helping settlements. The Palestinian neighborhoods of Occupied Jerusalem are being threatened by settler takeovers, plans for Israeli tourist activities at the expense of Palestinian homes, and intentionally discriminatory planning processes making it impossible for the Palestinians to build legally, leaving families with no choice but to move away or build illegally, they warned further. The delegation witnessed the increasing feeling of hopelessness among Palestinian young people, the creeping annexation now becoming blatantly “open annexation” in Area C of the West Bank. It also heard the pleas for aid from communities whose homes are under imminent threat of destruction and their families at risk of forcible displacement in Khan al-Ahmar and Sateh al-Bahr. The delegation visited the Ofer military court where children as young as 13 and young men were being prosecuted on charges ranging from throwing stones, political activism, to social media posts. There is a lot of procedures and very little justice in Israel’s military courts, human rights groups and lawyers told members of the delegation as they were walking near the barbed wire-topped metal bars and pre-fabricated cages that constitute the Ofer military court, meeting mothers and fathers waiting long hours in order to see their children across a court room. "After what we have seen in the Ofer court, we cannot but urge the EU to put justice and fair trials high on the agenda of any dialogue with Israel," Sylikiotis said. The delegation visited and assessed EU-funded projects on its mission, including a school for children with special needs in Bethlehem, rehabilitation projects in the Old City of Jerusalem and services in refugee camps. The Israeli occupation authority once again refused the delegation access to Gaza, where the European Parliament has not been allowed in since 2011. "This is unacceptable," Sylikiotis said, calling for an end to the prolonged Israeli blockade on the impoverished Strip. The delegation for relations with Palestine started its fact-finding mission last Monday. 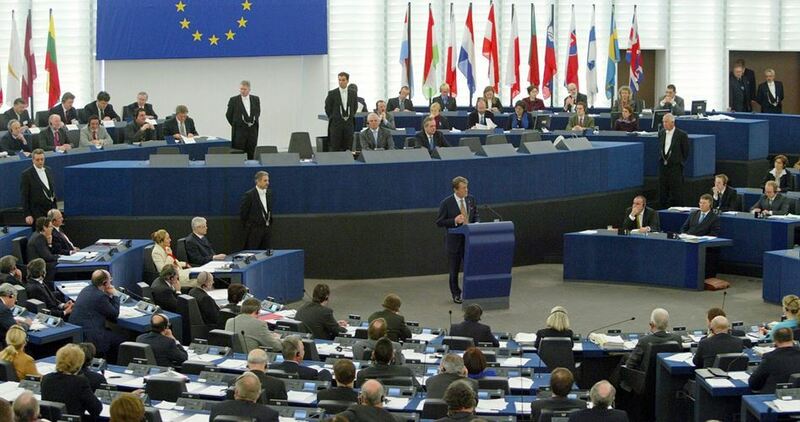 It is led by member of the European Parliament Neoklis Sylikiotis and includes four other members. A film depicting the torture, humiliation and violence experienced by Palestinians imprisoned by Israel won the first ever “Silver Bear” award at the Berlinale international film festival. The film, “Istiyad Ashbah” (Ghost Hunting), was produced by Palestinian filmmaker Raed Andoni. It was one of 18 finalists competing for the top honor at the Berlinale film festival this year. The ‘Golden Bear’ award was won by Hungarian filmmaker Ildiko Enyedi for the film “Testrol es lelekrol” (On Body and Soul). Andoni’s film “Ghost Hunting” involves a powerful re-enactment of interrogation rooms and prison facilities in the infamous ‘Russian Compound’ prison run by Israel. Currently there are around 7000 Palestinian men and women imprisoned by Israel. Over 750,000 Palestinians have been imprisoned since 1967 and the start of the Israeli occupation of Gaza, the West Bank and East Jerusalem. Most were sentenced by military courts, while others were held without any charges in so-called “administrative detention”. There are practically no Palestinian families that have been spared the experience of prison. 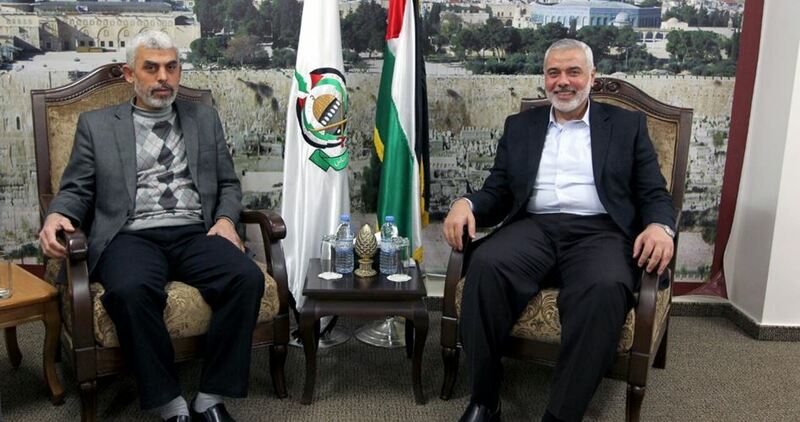 Deputy head of Hamas’s political bureau Ismail Haneyya on Sunday evening met with Yehya Sinwar, the new leader elected to lead the Hamas Movement in the Gaza Strip, and discussed with him the Movement’s recent internal elections. During the meeting, Haneyya and Sinwar discussed, in the presence of member of Hamas’s political bureau Rawhi Mushtahi, the transition protocol followed within the Movement when a new leader assumes his responsibilities. The two officials asserted that Hamas’s internal elections took place according to its principles of transparency, and its organizational regulations and rules. The statement stressed that Hamas, at home and abroad, would remain the bulwark that protect the Palestinian land and the constants of the national cause.